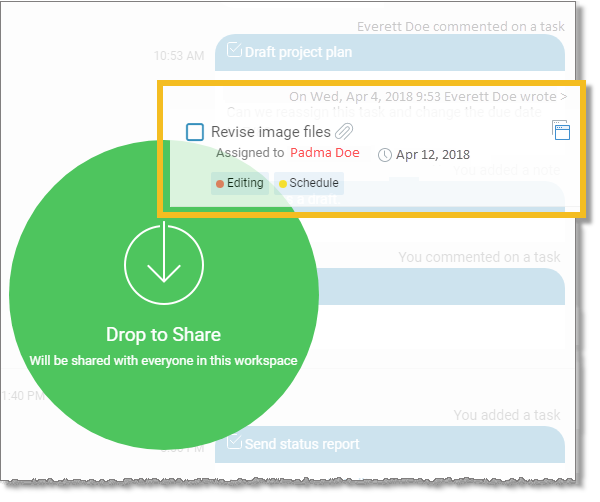 You can use drag and drop to easily move items between workspaces or share an item with all members of a workspace. In the panel at the upper-right, click the Notes, Tasks, or Files icon, depending on the type of item you want to move. A list of notes, tasks, or files appears. In the panel on the left, click the Feed icon . A list of all the workspaces you’re a member of appears. Click the item in the list that you want to move. 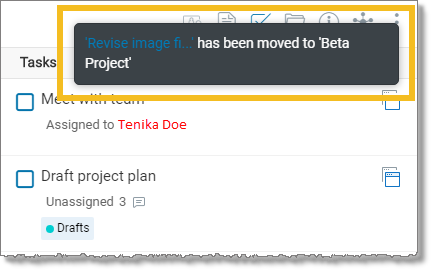 Drag the item to the Feed list and hover over the workspace you want to move it to. The workspace appears highlighted. Drop the item. A message appears confirming that the item has been removed. 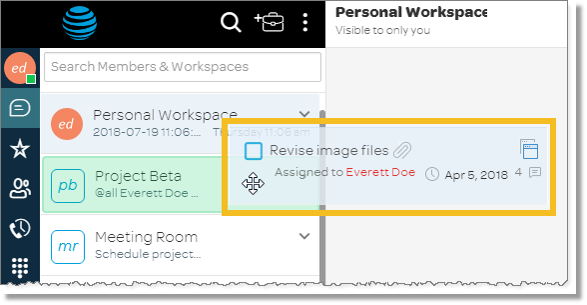 In the panel at the upper-right, click the Notes, Tasks, or Files icon, depending on the type of item you want to share. A list of notes, tasks, or files appears. Click the item in the list you want to share. Drag the item to the workspace Activities window. The Drop to Share image appears. Drop the item. The activity is logged in the Activity window of the workspace.